The Collecta for this day is at the church built by Pope Marcus, where the station was held on Monday after the third Sunday in Lent. Station was at St. Marcellus. The title of Marcellus stands on the Via Lata, on the site once occupied by the house of a matron named Lucina. Recent excavations have corroborated the data furnished by the, Acta of St. Marcellus, so that we may hold for a certainty that the church was erected during the pontificate of the martyr who was afterwards buried there. The Lenten fast is now drawing to its close, wherefore we pray in the Collect that the abstinence which we have practiced, being sanctified by the mortification of all our evil passions, may serve to enlighten the hearts of the faithful. God himself has placed this desire in our hearts, so we trust that he will graciously accept it and will grant it abundant fruit. The Station today is at the church of St. Marcellus at the Corso. Legend claims that Pope St. Marcellus (308-309) was sentenced by Emperor Maxentius to look after the horses at the station of the Imperial mail on the Via Lata, where the Via del Corso now lies. He was freed by the people, and hidden in the house of the Roman lady Lucina (see also San Lorenzo in Lucina). He was rearrested, and imprisoned in the stables. An ancient tradition links this church with the imprisonment and death of Pope Marcellus I (308-309). It is said that Saint Marcellus opened an oratory in the house of a devout lady, Lucina, widow of Pinianus, and that Maxentius (defeated by Constantine in 312) desecrated this oratory by ordering the horses of public carriers to be stationed here. He then condemned Marcellus to the duties of stable boy (catubulum), but this treatment exhausted the strength of the old Pope, and he died here in 309. Afterwards, he was buried in the cemetery of St. Priscilla. A letter from the Prefect Symmachus to the Emperor Honorius, written in the early part of the fifth century, speaks of the election of St. Boniface I (418-422) at the ecclesia Marcelli. After the death of Pope St. Zosimus (417-418), Eulalius (an antipope) was elected at the Lateran, but the true pope, Boniface I (418-422) was consecrated on December 29, 418 at San Marcello. This church, then, became the assembly point for the solemn papal procession. The oratory was enlarged in the fifth century, and in the ninth century the remains of St. Marcellus were brought from the cemetery of Priscilla and, along with those of Pope Vigilius (538-555), were interred beneath the high altar; they are still there today. 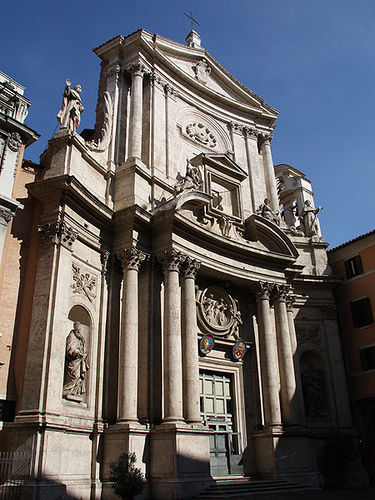 San Marcello is one of the original twenty-five parishes of Rome, and it was made today?s station by Gregory the Great. San Marcello was reconstructed by Adrian I and restored by Stephen V and Gregory IV. The old church burned down in 1519 and was rebuilt by Iacopo Sansovino. He completely altered the church by making it face the Via Flaminia (Via del Corso), where the apse had originally been. A wooden crucifix survived this disastrous fire, and so it became known as a miraculous object worthy of veneration. In times of stress or before major events in the city, the Romans used to carry it in solemn procession throughout Rome. It was carried through the streets, for example, in anticipation of the Second Vatican Council. This ?Crucifix of St. Marcellus? can be seen in the right middle chapel. Also note the many Renaissance tombs in the church. The most striking is that of Cardinal Michiel and his nephew, Bishop Orso, at the left of the main door. The cardinal was poisoned in 1503 in Castel Sant?Angelo by order of Alexander VI (Rodrigo Borgia, 1492-1503). Just below his reclining effigy is his nephew, portrayed lying on a bier, beneath which are stacked piles of books ? a memorial of the 730 precious codices that he bequeathed to the church. In 1912 a large baptistery, built into the original titulus, was discovered. Ask permission from the sacristan to see this, one of the oldest preserved baptismal fonts. From the fourth or fifth century, it is deep enough to allow for partial immersion. In 1920 extensive repairs had to be carried out because of the damage caused by a strike of lightening. The church of Saint Marcello is entrusted to the care of the Order of the Servants of Mary, whose Generalate is adjacent to the church. On the left-hand side of the church, the first chapel is dedicated to the Seven Holy Founders of the Servite Order. The third chapel on the left is the Chapel of the Sorrows of Our Lady, whose devotion is held in high esteem by the Servite Fathers.